This book was really easy but it had a nice twist at the end. I met the author at a book talk and she lives near me. We read this book in school and had to do a project on it. There are individual little books inside it that make up one big story. It’s really good. We weren’t allowed to read two of the stories at school so I found it at the public library and checked it out to read them. One is about a pregnant teenager and the other is about a boy who wanted to plant something illegal but plants something else instead. It wasn’t my favorite book but it was good. I wouldn’t have chosen it myself but since it was assigned, I had to read it. It was alright. I didn’t want to really keep reading. If it was my choice, I would have abandoned it. But I never would have picked it in the first place. But it was ok. This was my book club book and it got really, really good at the end. We went trapezing and that was really fun. I met Grace Lin and she taught me how to draw. Her book was good because she has little folk tales throughout the book that were interlinked and made the book make sense. This book was very interesting because it was about this princess with a curse and a blessing. Oh, this was soo good. It’s about this girl who can’t move or talk but she’s really smart but no one knows that. I met this author too. It’s about a boy who has a facial disorder and he has to go through school facing his problems and bullies because before he was homeschooled. This book reminded me of One for the Murphys a lot because the mother was bi-polar and the kid had to go through life without a parent figure. It was really good. That was really good too. It’s about a girl who has to face the Yellow Fever and struggles through it, kind of, mentally. More mentally than physically. Oooh, this was our book group classroom reading. It’s a good book. It’s sad. It’s about a slave who has a crazy owner and she gets abused. I really liked this book because it was about the Civil Rights Movement and the Black Panthers in Northern California and we don’t study that at all. My teacher recommended this book to me. It’s about the Holocaust. The main character is Christian but her best friend is Jewish. It’s about her escape to Sweden. It’s about a girl who is very shy but finds her voice through her best friend. But her best friend is black and she lives in a segregated community and she has to find ways to see her friend but it’s very dangerous because they don’t support white people seeing black people. You have a diverse and interesting list posted here. You might be picky, but you are very well read! Thank you so much! I have a hard time finding any books I like at our school library but my teacher made really good suggestions for me and I liked all her books. Also, I like reading books of authors that I’ve met. My mom gives me suggestions too but I don’t like most of her picks. Thank you so much for the recommendations. My daughter is in Grade 4 so very close in age to you. She just recently read the first book in the Lemonade Wars and totally loved it! I hope your daughter will read the rest of the series too! What is her favorite book so far? Does she have to read 5 books this summer too? I’m not Mrs. Stockdale but I hope she comes back. Don’t worry, I’m sure your new teacher next year will be better. Just try your hardest and it will get better. I looked at your book list (from a link on your mom’s blog) and it has many books I’ve read on it. 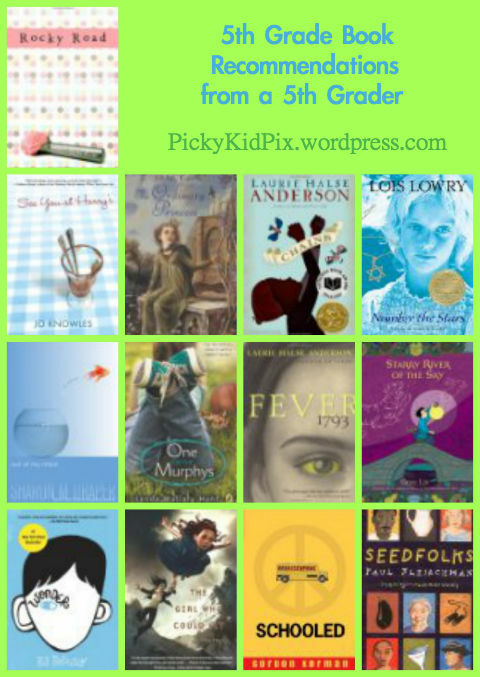 I’m curious about the books you read as a 6th grader since I teach 6th grade. Please update your blog with your 6th grade favorites. It will be interesting to see how many of them I’ve read. My favorite from your 5th grade list would be One for the Murphys and then Chains. I loved Chains, but you’re right – it is a sad book. I also loved Lions of Little Rock. Hope to see a post from you soon. I am getting ready to post on my 6th grade list. Thanks for asking! I really liked your books you recomened! You made really great details!!!!!!!!!!!!!!!!!! Try reading The Sister Pact Adventures by KM Parisi The first three books are available and geared toward early readers in 4th and 5th grade. You will love them and please place on website. I love these great books!